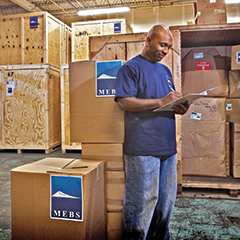 Operating as TSA Cargo Screening Facilities, MEBS warehouse personnel are trained to inspect every item and sub-line item entering the MEBS transportation system. This level of detailed screening further enhances the inventory control offered to MEBS clients as serial numbers, part numbers, and asset tags are tracked, door-to-door, and worldwide. Attention to detail in the receiving stage permits MEBS to produce customized documentation specific to destination country regulations.